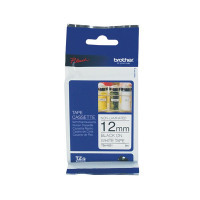 Supplied on a long 8m roll, this TZN labelling tape from Brother is perfect for identifying and labeling items with your P-Touch label maker. This 12mm wide tape is non-laminated, making it suitable for general purpose indoors use. The adhesive backing is resistant to changes in temperature, so it'll stay attached in all weathers and conditions. Black text on a white background lets you colour code your labels for efficient use.